My Sister's Runner: I AM A RUNNER, PERIOD. 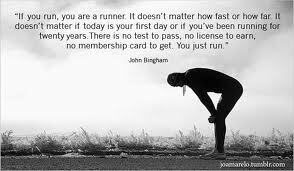 So often I will say I am a runner but: but, but, but. But every once in a while there comes a moment where there is no but. I am a runner, period. This week it came in a moment while preparing for my trip to Seattle. My first concern? Even before I scheduled my doctor's appointment I was scoping out the local racing calendar. Signed up for a virtual race because I could find a local one. Mental packing list started, only items on it? Running gear clothes, shoes, racing bib, headphones, Garmin. My next thought? Can a squeeze in a trip to an actual running store? How would be so amazing to go through a store with nothing but running stuff. See those things I have only seen online. Is there a running store next to the commercial fishing store? Billy has his priorities too. My priorities are definitely on the run. I am really looking forward to running outside. The track has gotten very boring. But can't run on ice in the dark. So until the days get a little longer or the paths a little clearer here at home the track is the place to be. I have to say this transition from the bleachers to the field is amazing. I feel so good about the road I am on. The things my body is able to do, funny how many impossible things are possible once we stop making excuses.